Description: This modern solar pit house is based on the traditional pit house. The construction is much the same. Additional ‘modules’ have been added to create an elongated rectangular design for added living space and windows added on the south for solar gain. Each module is based on wood posts set in geopolymer or concrete footings. Wood beams approximately 10”-12” diameter are joined at the posts with half lap joints and pinned in place with rebar or logging spikes. Smaller poles around the perimeter lean against the beams. 24” wide earthbag walls with a reinforced geopolymer or concrete bond beam rest on rubble trench foundations. 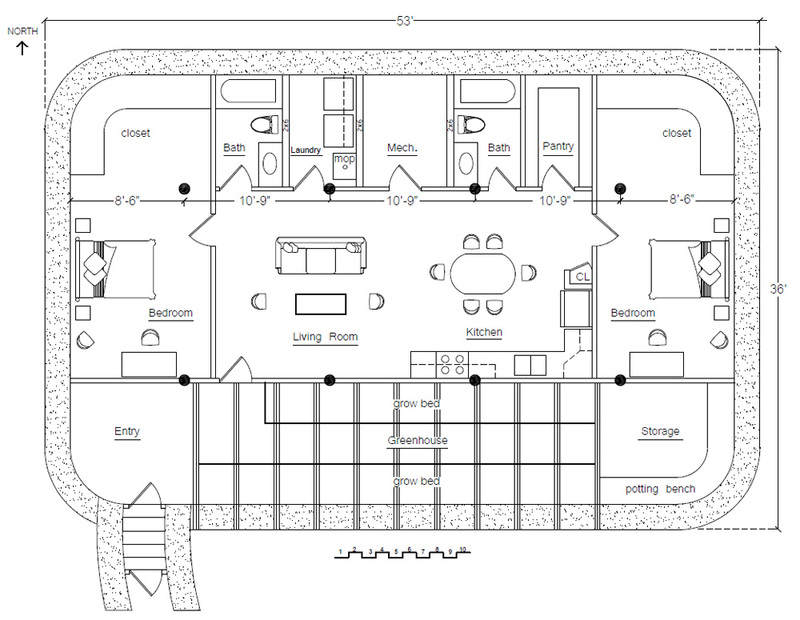 Complete drawings available at http://naturalbuildingblog.com/house-plans/free-house-plans/. Note to other designers: I’d like to refine this design with input from other design professionals and make all drawings freely available on the Internet. Please email me at strawhouses [at] yahoo.com if you would like to contribute. Or just leave a comment here if you’re short on time.